For some, a romantic getaway calls for balmy breezes and long walks on the beach. But for those of us who can’t swing a seaside escape this Valentine’s Day, embrace winter’s allure instead with a weekend getaway to the charming town of McCall, Idaho. Perched on the shores of Payette Lake, McCall is just a two-hour drive from Boise and offers endless bonding activities for couples. Whether your relationship could benefit from a relaxing candlelit dinner or needs to be shaken up a bit with an adventurous day of snowy play, a trip to McCall is sure to get you and your better half in the mood for love. Tamarack’s Osprey Meadows golf course offers access to 15 kilometers of groomed Nordic trails with terrain ranging from flat open space along the groomed greens to hillier, wooded areas towards the ski hills. Cozy up après snowshoe in front of the stone fireplace at Seven Devils Pub in Tamarack Village and sip a pint of “Powder Junkie” amber ale from Crooked Fence Brewing Company. Before you head to your final destination, make a pit stop at Gold Fork Hot Springs located a short drive from Tamarack in Donnelly. Gold Fork has a series of pools in a range of temperatures for all comfort levels and is designed for serious lounging. Enjoy a nice long soak before hopping back in the car for the final stretch of your journey. Continue on to McCall and clean up for a romantic end to a fun-filled day: a lake-view dinner for two at Rupert’s restaurant in the historic Hotel McCall. Rupert’s gets rave reviews for its fresh, creative and delicious dishes. Owner-manager, David Carey, and award-winning chef, Gary Kucy, have reached the perfect balance between elegance and modesty with everything from the seasonal menu to the warm dining room décor. A delicious meal at Rupert’s Restaurant. Gourmet yet un-fussy regional game and seafood specialties such as venison meatballs, shrimp scampi and rosemary lamb chops headline the dinner menu. A thoughtful wine list rounds up offerings from around the globe as well as selections from Idaho’s own Snake River Valley, a region flourishing with grapes from vibrant Viogniers to savory Syrahs. End your unforgettable meal by sharing a sweet treat with your sweetheart before turning in for the night. Start your second day with a stroll along frozen Payette lake to Stacey’s Cakes, an inviting, cheerful bake shop owned by Stacey Kucy (chef Gary Kucy’s wife), for a light breakfast before a day of pampering at the spa. Stacey started whipping up goodies on a weekly basis for her farmer’s market stand when the Kucy’s first moved to McCall, and it wasn’t long before she had to open a storefront to meet demands from sweet-toothed residents. Gary and Stacey Kucy at Stacey’s Cakes. Now it’s not uncommon to find Gary or the couple’s 11-year-old son helping out behind the counter during the morning rush while Stacey churns out decadent scones, muffins, cookies, pies and elaborate celebratory cakes. Not only will Stacey’s perfect pastries make your taste buds swoon, but watching this adorable (and talented!) duo work together in the kitchen is sure to stir up fuzzy feelings. Be sure to purchase a package of gingersnap cookies for the car ride home, or a colorful and comical “Who Tarted?” t-shirt souvenir. Next, indulge in a couple’s massage at The Cove Spa at Shore Lodge. Arrive with ample time to spare before your scheduled treatment so you can unwind with a dip in the heated indoor/outdoor immersion pools, read a book by the outdoor fireplace or enjoy the steam room and sauna amenities. The Cove Spa at Shore Lodge hotel. Afterwards, enjoy a nourishing bite from the comfort of your lounge chair, like a Pacific Salmon Nicoise Salad or a Northwest Chicken Wrap. Wash it down with a fresh pressed juice or a signature Huckletini, made with local vodka, fresh limes and huckleberries. The staff and surroundings at The Cove make it incredibly hard to leave, but highly anticipated dinner plans with Blue Moon Outfitters will help motivate you to move again. Grab your snowshoes and a growler of craft beer from Salmon River Brewery and head to Ponderosa State Park. Tiki-torches light your path for the easy one mile trek to the rustic Blue Moon Yurt where a mouth-watering “winter culinary adventure” awaits. Smiling faces and a mug of hot mulled wine greet you at the door of this cozy, candle-lit abode. After mingling with your table neighbors for a while, your hostess, Lisa Whisnant, will introduce herself, the staff and the menu before serving the first course: platters of sesame marinated grilled asparagus and a roasted red pepper stuffed brie cheese. The rest of the menu relies on Northwest staples like duck and salmon enhanced with ethnic ingredients like lemongrass, peanut sauce and coconut. Dinner at the Blue Moon Yurt. You will be so blown away by the amazing meal and stimulating conversation that it will be nearly impossible to imagine the evening could get any better. Then, you grudgingly begin the trek home and notice the night sky overhead, blanketed in stars so clear and bright it looks like someone threw a handful of glitter across the moon. The moment is so magical you won’t be able to resist stealing a smooch from your sweetie. This morning, check out of your lodgings and head to the Pancake House for breakfast before your final snowshoe hike of the weekend. This is not the Pancake House that you recall seeing near truck stops on your last road trip, but a true home-style kitchen housed in a bucolic Victorian mansion. Enormous cinnamon rolls, plate-sized stacks of fluffy pancakes and a variety of hearty egg dishes await to fill your growling stomachs. Make sure to wander through the year-round Christmas shop in the back of the restaurant on your way out. Overlooking the Jug Mountain Ranch nordic center. 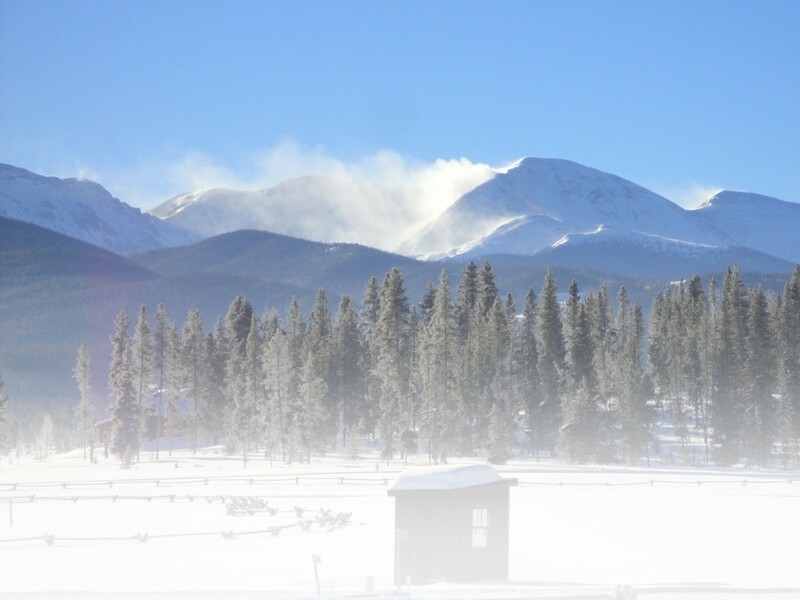 A short drive south of McCall leads you to Jug Mountain Ranch, a “snowshoe haven” featuring home lots, a golf course, clubhouse, restaurant and a Nordic center with more than 25 kilometers of groomed winter trails. For a great workout and gorgeous views of Jug Mountain Reservoir try the 11 kilometer “Reservoir Loop” trail. For a quick jaunt with beautiful meadow scenery, check out the 3 kilometer “Honeymoon Hollow” loop. Find a quiet, scenic spot to rest and devour the sandwich you picked up from Two Sisters Deli on the drive in. Take your honey’s hand and savor the last few moments of togetherness before you return home to reality. Thanks to McCall, you’ve met some great people, shared some new experiences together and discovered the quality time you were seeking (no beach required). Sunset snowshoe at Ponderosa State Park. I enjoyed your article on McCall Idaho, it has many years since I Traveled to McCall to call on the Telephone Co there, not only is it great in the winter months it was always great in the summer.